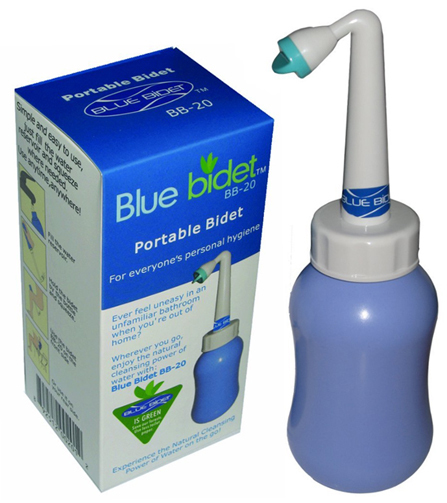 Portable bidets (also known as travel bidets or bidet bottles) come in two basic varieties: battery-powered and non-powered. Either sort will produce a water spray you can use anywhere. Today I'll cover the non-powered type, the kind that you simply squeeze with your hand. I've tested four models to introduce to you. Let's see how these travel bidets compare. 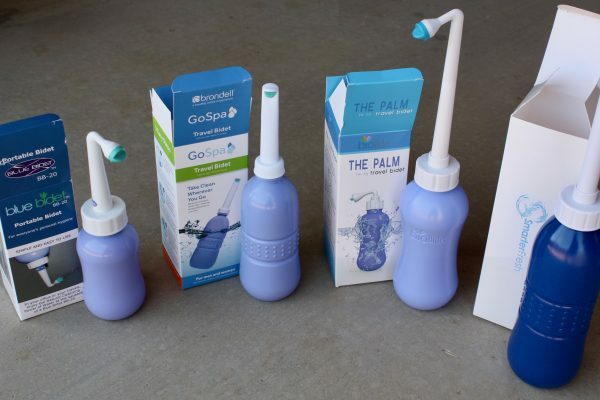 The 4 hand-squeezable bidet models I tested for you are the Brondell GoSpa GS-70, the Bio Bidet TP-70, the SmarterFresh SF-P30 and the Blue Bidet BB-20. Each model has its unique features. Note I didn’t say “its pros and cons”. A few had very unique “pros”. However, it would be hard to find many distinctive cons for any of the following, since they all have pretty much the same drawbacks. So, without further ado, let’s dig into the 4 models (listed below in no particular order). Brondell has a well-earned reputation for its line of bidet seats. But it also makes a number of portable bidet models. The GoSpa GS-70 well deserves the moniker since its among the best selling and easiest of travel bidets you can take anywhere. The little unit has a bottle about 6.5 inches tall, with a wand that extends about an additional 3.5. That makes it a cinch to put in a purse or pocket as the wand is reversible i.e. you can easily unscrew the integrated wand/cap, turn it upside down and insert it back into the little fluid-holding bottle. It would be a nice improvement if Brondell would modify the wand/cap a little so that it screws in upside down rather than simply hanging loose, but that’s a minor item on my wish list. That “minor” claim is especially true as the GoSpa (like all the models here) comes with a little carrying bag. Put it inside and that will prevent the wand from wandering. The bottle holds about 400 ml (or 14 oz) of fluid. Note I didn’t say “water”, though that’s clearly going to be the most common thing you put into the bottle. It could contain a mild cleansing agent, if you wanted (for example) to use this bidet as a douching aid also. It’s compact, made of easy-to-squeeze plastic that seems fairly durable for all that. It’s helpful that the central portion has a molded-in ring of raised knobs that improve your grip. The downside is that it does take a fair amount of force to squirt a stream far enough and hard enough to thoroughly clean yourself. Of the four models reviewed here the Blue Bidet BB-20 had the potential to be my favorite. Compact, with a nifty integrated wand/cap, it’s easy to carry and use. But ample testing softened my enthusiasm. At about 10 oz (300 ml) the volume is less than many other models, but I could get three long and full squeezes before it emptied. That proved plenty for my normal personal hygiene needs. Also on the upside, the spray nozzle is very well designed and offers good pressure and accurate aiming ability. There was a minor drawback with this model: paradoxically, the integration of wand and cap. It certainly removes any possibility of leaking between the wand and cap. But I did have trouble with this unit leaking between the cap and bottle, at first. Fortunately, I was able to unscrew and re-screw the cap on and totally eliminate that problem. Because of the cap diameter and angle of the wand end, I had a tiny struggle with getting the reversed wand back into the bottle after I was finished. This again is a trivial issue but it’s one of those little annoyances you wish didn’t arise in the first place. In the end, I would’ve preferred a bit more capacity, a little tighter seal, and slightly better ease of use. All of the downsides are very small, certainly. But the price – at just over $13 – was higher than competing models, so I was hoping for a superior design. I didn’t get that here. By contrast the Bio Bidet TP-70 proved to exceed my expectations in several ways. 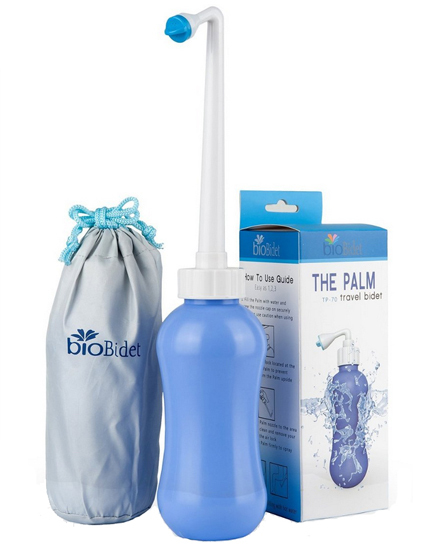 Also known as The Palm, the bottle provides a “Goldilocks” medium capacity at 450 ml (~16 oz). That gave me a full four, long and hard squeezes and it still wasn’t completely empty. Frankly, because of the wand/cap design I expected at first glance to have a problem with leaking when it was turned over. Not a drop. The wand inserts/extends from the cap, which requires a very tight seal to ensure no dripping. Lo and behold, the TP-70 does that. The secret is a very well-designed and superbly implemented seal mechanism built into the base of the wand. It’s a sort of double O-ring – and it just works! You can tip it any angle and squeeze the bottle as hard as you like. Provided you keep the wand fully extended, you’ll experience no leakage at all. Keeping it in place requires only a firm tug on the wand when you pull it against the cap. Naturally, if you turn it upright and the wand slips back into the cap a bit that seal will be broken. But then, you wouldn’t use it in that position anyway under normal circumstances. And thanks to six cleanly drilled holes in the hard-plastic cap – three on either side of the little divider arranged in a pair of triangles – the spray is both high-pressure and accurate. There’s no wild stream shooting off to inconvenient spots on this model, as there are on some. Though all the models in this review performed well in this regard, the TP-70 did the best in my tests. And, like the other models reviewed, there’s an “airlock” on the bottom. If your fingers are long enough, and you have a little dexterity, you can easily prevent any water flowing out when you want to stop it. Put your index finger over the hole with the bottle upside down (the normal orientation during use) and the water stops dripping after a couple of seconds. Most users’ hands will be big enough to do this. 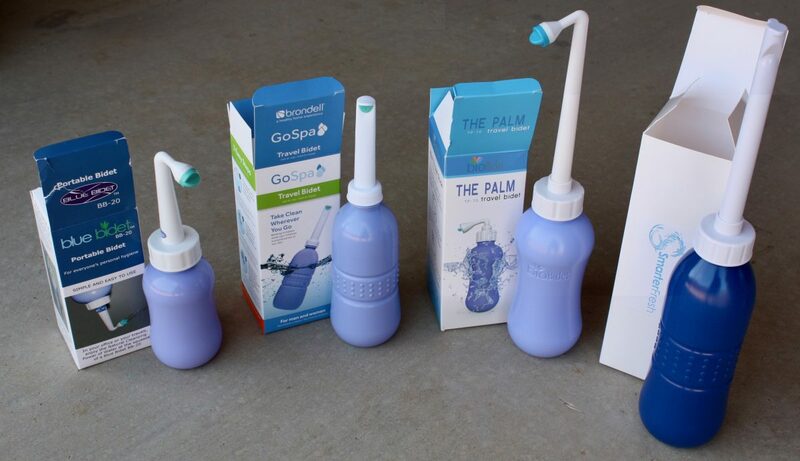 The bottle is made of very flexible plastic so it isn’t abnormally difficult to compress. But it feels sturdy, and I’d expect this material to last a good long time without cracking. Only long-term use could prove the point but early signs are promising. Since the wand inserts back into the cap without the need to reverse it, putting it away after use is quick, simple, and requires no fumbling. You can even do it with one hand, if need be. 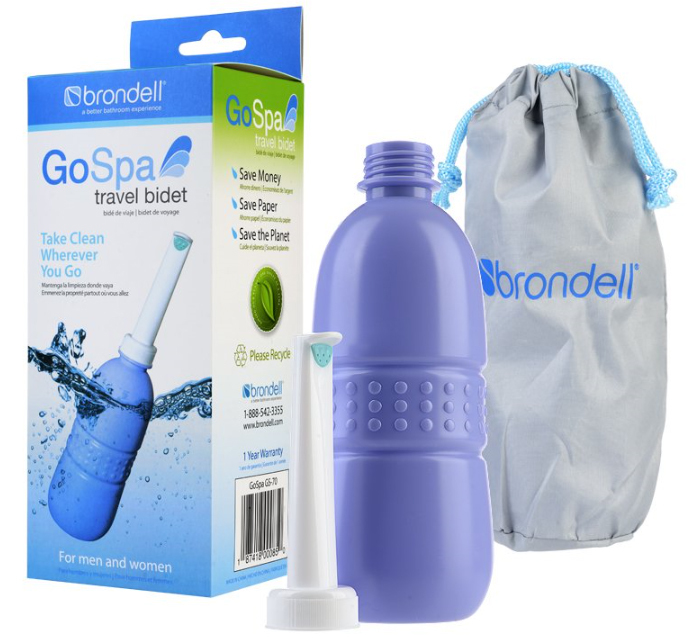 And, last but not least, at just over $9 on Amazon, this travel bidet bottle was among the least expensive. That’s not a huge difference from the others, but for such a fine design that’s a nice little extra. I always enjoy getting more for less. 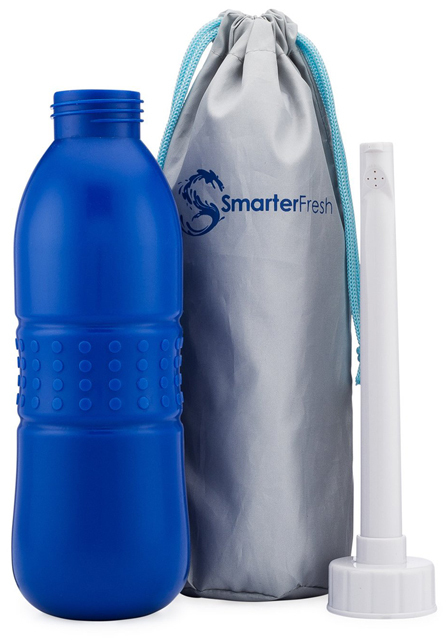 The SmarterFresh SF-P30 is something of a different animal among travel bidets. It’s a highly portable bidet bottle like the rest, but a little less so because of its considerably larger size. The bottle is nearly nine inches tall and the wand stretches that a further seven. Luckily, or cleverly I should say, the cap doesn’t need to be unscrewed nor the wand reversed for storage. You just give it a little shove to poke it back inside the bottle. However, that means you must pull it firmly out before turning upside down for use. When new it fits in the cap firmly, but I do wonder if over time a small gap might develop. Ample and repeated heating and cooling over many months would gradually tend to encourage that, too. So far, though, it has performed flawlessly. The massive 650 ml (22 oz) storage capacity allows for holding enough water to make sure you always get a complete rinse. We all have days when that can be a big benefit, no? One potential drawback is that the plastic feels a little less “rubbery” than the other models. I suspect it might be prone to cracking long-term. It feels right now as if it could be pretty durable, but only testing over a lengthy period will reveal whether it will break down with long-term use. If it lasted two years it would still be a very good deal. Like some others, this model sells for around $10 – a fairly modest investment for such a valuable benefit in your health and comfort. I started off by saying that none of the four models reviewed here had distinctive “cons”. That’s only partly accurate, of course. They all have their quirks. But they all have one drawback that is very much the same. As a non-powered travel bidet, each one requires a fair amount of force from your hand in order to produce a high-pressure, steady stream. For some individuals that can be a difficult task, especially when away from home and possibly in a hurry to cleanse and go about your business. Luckily, there are battery-powered travel bidets that overcome that difficulty. I’ll review four of those soon for anyone who didn’t find here – as I did – a travel bidet that said “buy me now!”. That said, they’re all very usable and will all get the job done. The Bio Bidet TP-70 was a clear favorite, my 1st preference of all of them while the Blue Bidet BB-20 managed a respectable 2nd place in my view.